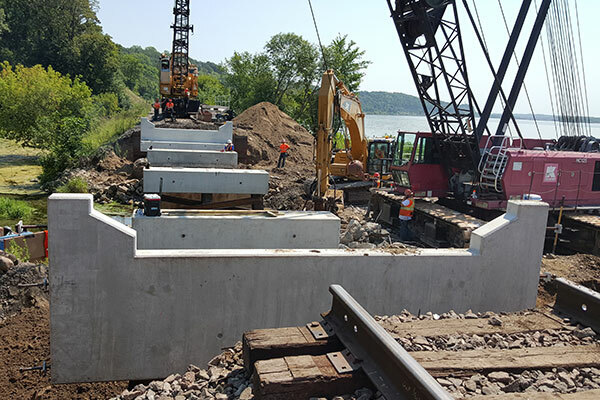 Kraemer assisted BNSF crews to replace the BNSF bridge along the Mississippi River over a backwater channel near Cottage Grove, MN. Kraemer excavated the existing bridge timber, performed concrete removal, and installed material for work platforms. A Terex American HC125 was brought on site through the use of a crane train to accommodate restricted site accessibility, as the nearest roadway crossing was approximately 2.25 miles from the project location. Kraemer’s work included work platform construction, pile driving, and precast concrete abutment, caps, and girder placement.